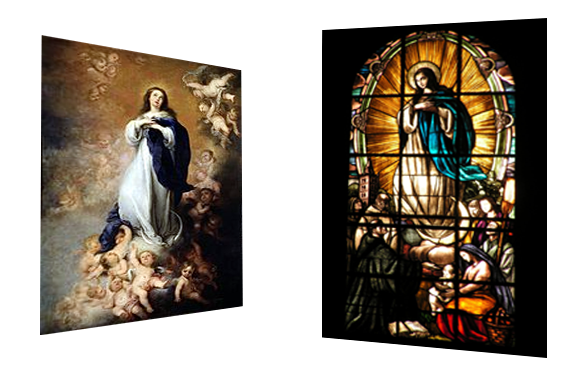 The Assumption of Mary in the window of our church , inspired by the painting by Murillo (1678 ) which is now in the Prado Museum in Madrid . This window , the work of a Florentine company was placed on the 50th anniversary of the return of the Benedictine monks in Finalpia (1955 ) . Our Lady of the window does not look up , but look at the people of " Pia " at his feet : monks and population .
" A great sign appeared in heaven: a woman clothed with the sun, with the moon under her feet, and on her head a crown of twelve stars ." 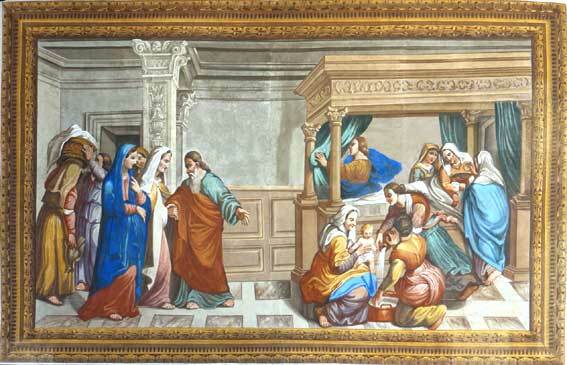 FEAST OF ' THE NATIVITY ' OF MARY B. V.
Painting on the ceiling of Our Sanctuary ( Andrea Rossi , sec . XIX) . His mother , Anna , is still in bed . Next to the bed some women are washing the newborn baby girl. At the foot of the bed 's father , Joachim, comments the event with some acquaintances . On the left corner the used linen are taken away. Room decor recalls the wealth of the family . devotion to the Blessed Virgin Mary is part of the early Christian tradition . A testimony of this devotion is also found in our church , which was erected in her honor in sec . XIII , at the bottom of the valley Pia , near the mouth of Sciusa . Surely in the church there was an image of the Madonna , perhaps a painting . But we do not know anything . 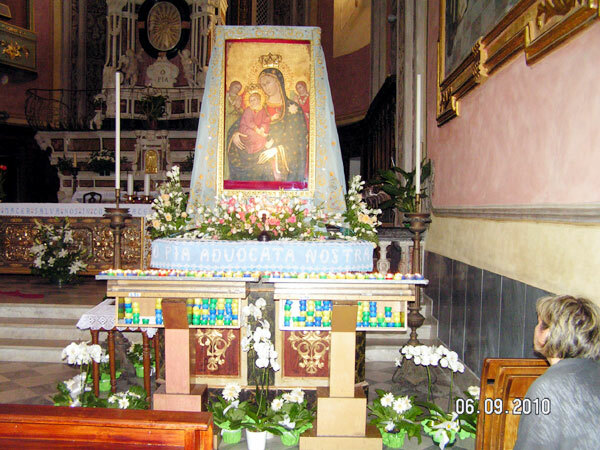 The painting of Our Lady of Pia , whom we venerate today in the church is from XIV century and is attributed to the Genoese painter Nicolò da Voltri . For centuries, the Feast of Our Lady of Pia was celebrated on September 8 , the day dedicated to the Nativity of Mary. With the proclamation of the dogma of the Assumption (1950 ) ,they choosed the Assumption as special patroness . So in Finalpia is honored - in particular - the Madonna when she entered the world ( Nativity ) and in the blessed moment when she entered the Heaven (Assumption ) . The Patron Saint's Day on August 15, comes alive with religious and civil celebration on September 8.